The Hautes Corbières – a massive, wind-swept limestone block only good, agriculturally speaking, for growing vines, raising sheep, and gathering exotically scented honey touched by the essence of wild rosemary. This is one of the wildest and most sparsely populated regions of southern France. Small villages are linked by narrow, winding roads and around every bend the ruins of an old Cathar castle. But what seems like a land lost in time is actually one of the most exciting wine regions in the world. It was only a few decades ago that the Languedoc-Roussillon was known mainly for its cheap and plentiful wine. Yet the best growers have proved that the region has far more to offer and continue to push the quality envelope. This reawakened focus on excellence over quantity is attracting young winemakers from all over France. Like native Burgundian, Maxime Magnon, who is reclaiming old-vine plots in high-altitude vineyards to produce wines that not only speak of the land from where they come but also made in a way which emphasize purity of the fruit and immediate drinkability. Wines of sun and stone. Magnon cultivates his vines with respect for nature and the soil. Although what stands for soil here is mostly just pure rock and Mediterranean shrubland (garrigue). A few cattle serve for weed control and fertilization. He’s certified organic, but also incorporates biodynamic practices into his vineyard management. In the cellar, sulfite usage is minimal and strictly governed. 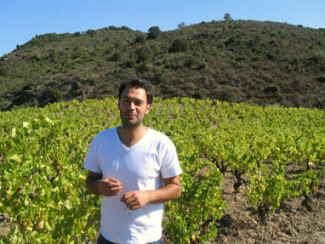 He has studied under some of the most respected winemakers in France and it shows in the wines. 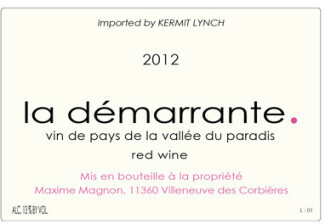 The 2012 Vin de Pays de la Vallée du Paradis “La Démarrante” is Magnon’s easiest drinking cuvée. A light ruby blend of Cinsault and Carignan that does not adhere to appellation rules and therefore designated “country wine”. It’s brimming with juicy strawberry and floral notes and the most subtle hints of spice. This is a silky red wine with lively acidity that will also take a chill well. It’s almost Beaujolais-like in attitude and perfect for pairing with summer fare. We’ll also have Magnon’s top two cuvées from Corbières A.O.C., 2012 Rozeta and 2012 Campagnès. Rozeta is particularly unique, from Carignan vineyards that are dispersed with numerous varietals of older vines, namely Grenache Gris, Macabou, and Terret, which are all picked and fermented together. Campagnès is a single vineyard of hundred-year-old Carignan, and is the most age-worthy in his line-up. These wines show similar approachability as La Démarrante but have more concentration and structure. These wines are aged in second-hand, Burgundian barrels sourced from a producer in Chassagne-Montrachet.